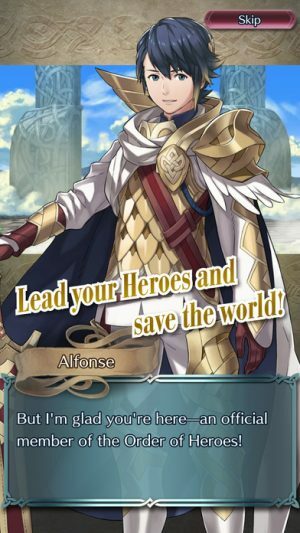 The free-to-play Fire Emblem Heroes [Free] is finally upon us, and it’s not as bad as some feared it would be. While the game certainly takes cues from other social RPGs like Puzzle & Dragons and Monster Strike, it’s not nearly as hard on players as some examples of the genre. Still, if you’re new to Fire Emblem, strategy games, or social RPG mechanics, there is a lot to take in here, and the game isn’t always that good about explaining things. With that in mind, I’ve put together some tips and advice that should help you find your feet. Unlike the characters in Fire Emblem Awakening, right? Ha ha, we have a lot of fun around here. Don’t worry, my advice is better than my jokes. Ditch the characters the game gives to you ASAP. I know, they’re the speaking characters in the story and everything, but they’re awful, trust me. You should only use them until you have literally anyone better to fill their role. So for example, you can use Anna until you get another axe-wielder, but not a moment longer than that. Reroll if you want to, but you really don’t have to. Some players like to “re-roll” with the free premium currency the game gives you, deleting the app and playing through the tutorial again and again until they get a five-star character. If you opt to do this, remember that you should not link your My Nintendo account to the game until you get your desired result. That said, I didn’t pull anything higher than a three-star character with my initial freebies, and I still made it through the story just fine. It’s up to you. Make some friends fast. You can find your friend code by touching the glowing stone on the bottom-left side of your base. That will bring up the Friend List, and tapping on the magnifying glass will show you your friend code. You can also send friend requests to anyone you fight in the Duel mode. You can only have 50 people maximum on your Friend List, but you’ll want to gather up people as quickly as you can. Doing so helps you earn feathers, and you’re going to need a lot of those down the road. Create and link a My Nintendo account. You get ten free Orbs for linking a My Nintendo account, plus you’ll earn My Nintendo points for beating chapters. Those points can be exchanged for useful items, so even if you don’t own any Nintendo hardware and don’t plan to, it’s still worth making an account. Don’t forget to collect your rewards. Empty out your present box often. It’s in the upper-right corner of your base. You should also check the fountain on the bottom-right and turn in any quests you’ve completed. It’s a good idea to look through those quests before you start going on the story missions, as some of the requirements are quite specific. Do not pull from the Summoning Portal if you don’t have 20 orbs. The game gives you a discount for drawing all five of the characters from a crystal. It’s like getting one character for free, in the end. The game might seem generous with orbs at the start, and it is, but the easy orbs will dry up quickly. Don’t waste them on impulse. That being said, if you’re searching for a particular type and that type isn’t in the crystal on your first pull, you’re only a single orb’s worth of discount if you back out. Early on, when you’re still trying to establish your core team, it’s not the worst strategy. But don’t even start to pull if you don’t have 20 orbs to see it all the way through. Keep in mind other type advantages and disadvantages. Mages can attack and counter from a distance, but their defense is generally quite poor. Flying types are useful for getting around the map, but they are critically weak against archers. Dragons are awesome, but they can be taken down easily by an opponent wielding Falchion or another weapon strong against dragons. Even basic fighters can run into real trouble if the enemy is heavily armored. Having a good team balance is essential. 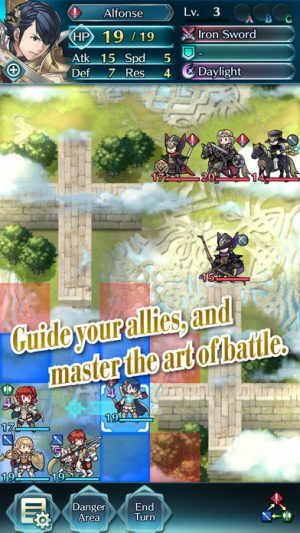 So, for example, don’t bring an entire party of fliers into a map with archers. It won’t end well. Consider what you’ll want in your fourth party slot. The game usually gives you a preview of which elemental types of enemies you’ll be facing in the next map. Based on that, you might want to spend your fourth party slot doubling up on whatever element will give you a leg up. It’s also not a bad idea to bring along a healer or an archer, depending on the map. Healers become particularly useful once you unlock their ability to attack, as they can serve in a partial mage role, too. Ninjas, thieves, and rogues can be very helpful, but you’ll have to put some time into unlocking their abilities before they show their true strength. Star ranking is extremely important. If you have a choice between a four-star character and a three-star character of the same type, even if the latter is a fave, you’ll probably want to bench them. Star ranking determines just how well the character can grow, and a higher ranking means better stats and even more abilities in some cases. Three-star characters can fill positions until you get better ones, but you’re going to have a tough time beating the story with them. As soon as you have a four-star or five-star character that can do what they do, shuffle them out and start building on characters with a future. Don’t forget to learn and equip skills. The game isn’t great about telling you about this, but if you go into the Allies tab, you’ll find all sorts of useful stuff. You can level up characters using crystals, merge characters to gain SP, stats, and levels, rank them up if you have the materials, and perhaps most importantly, have them learn and equip skills. 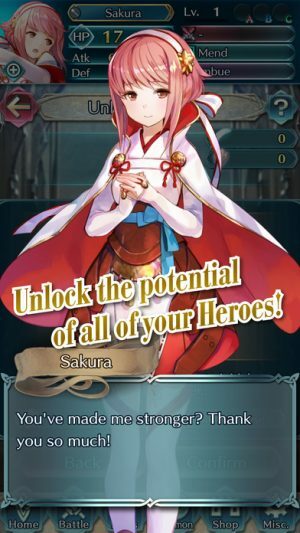 As you level up and fight battles, characters will earn SP. You can trade those points to learn new skills that will help you in battle. This is where much of the variation between characters comes in, so as you pad out your roster of viable characters, you’ll want to pay careful attention to their skills. Know the strengths and weaknesses by heart. If you can help it, never put a character up against the type they’re weak against. The same type is fine, but make that weapon triangle work for you, not against you. Never put a flier in range of an archer. Keep dragons away from enemies that can deal heavy damage to them. You’ll know because they’ll be marked with an exclamation point when you select the character. Keep your healers in back. Remember that archers and mages can attack from two squares away. Use the terrain to your advantage. Look for choke points, small gaps where the enemy has no choice but to file in one at a time. Put your characters around them and play pinata with anyone silly enough to walk in. Fliers have a big advantage on maps with gaps that prevent others from crossing, which is a good reason to have one in your party. Also keep in mind that although mounted fighters are usually strong, they can’t enter forest squares. You can use that against the enemy quite well at times, hiding vulnerable characters away from the action. Do not let yourself get surrounded. Anytime you are within range of the enemy, ask yourself how many sides you could be attacked from. If it’s more than two, you have a big problem. Use natural barriers and the rest of your team to make sure characters can’t be overwhelmed by too many opponents at once. Sometimes the smartest thing to do is nothing at all. One of the most important things to learn in a game like Fire Emblem is how to manage the distance between you and your enemies. Ideally, you want to be in a position where you get the first attack, which means you want them to move into your range, not the opposite. Don’t move into an enemy’s attack range unless you can get close enough to attack them on the same turn. You can just pass your turn and let the computer be the stupid one most of the time. Decoys work nicely. Sometimes no matter how long you wait, the enemy won’t move until you reach a certain square. In such cases, send in either a totally expendable unit or one that is equipped to survive a few attacks to draw the enemy out. Move slowly, a square at a time, until you get the desired reaction. Then lead them back to the rest of your team and do that pinata thing. This technique is necessary for surviving the later maps in story mode. Use skills to your advantage. There are a lot of different skills spread across the characters, but some are more useful than others. Certain characters will deal automatic damage to enemies or surround enemies after attacking, for example. Since that damage ignores defense, it’s a great way to whittle down the HP of tough armored enemies. Even simple buffs and debuffs can give you the leg up on an otherwise insurmountable enemy. Use the Danger Area button to see the safe spots. Tapping that button will show you where the enemy can and can’t reach on their next turn. You can also tap on individual enemies to see their range, which is quite useful when trying to get a flier through enemy lines. Remember, there’s no benefit to rushing in this game. Take your time, pay attention to all of the angles, and then act. Use your three free shots at Duel mode each day. Duels use a separate stamina system, one that only gives you three chances every day. Winning duels will gain you feathers at the end of each season, an item necessary for ranking up a character’s star level. It takes a lot of feathers, so don’t miss out on any chances to earn more. If you find yourself outclassed by the story missions, head to the training tower. Not only can you earn more experience and levels, you’ll also gain emblems that you’ll need to rank up a character’s star level. You’ll open higher levels of the training tower by unlocking the story mode, so if you find that you’re not getting much benefit from the highest level available to you, you’re probably good to beat whichever story map you were stuck on. Check the special maps each day. There’s a different character challenge in there for you every day. The best you can get at the moment is a two-star version of the character, which is admittedly not very useful. But it at least lets you check out that character’s art and get a basic sense of their skills so that you know if they’re worth ranking up for chasing after in a Summon draw. Plus, you can merge them later for more SP. There are sometimes other maps in the special area that offer extra prizes and bonuses, so get in the habit of popping in there each time you play. Beating the story stages on higher difficulties earns you additional orbs. Each time you beat a stage again on a new difficulty setting, you’ll get a free orb. You’ll probably be able to handle the hard versions of the maps earlier than you might expect. The level range should give you a clue as to whether you can feasibly tackle them or not. You can upgrade your castle using orbs. Yes, it’s not as fun as drawing new heroes, but once you have a solid team put together, you might want to invest some orbs into your castle. Doing so will give you a permanent experience point boost for all of your characters, and believe me, keeping levels up to the required standards becomes a big issue later in the game. Having an improved castle can help bridge that gap. 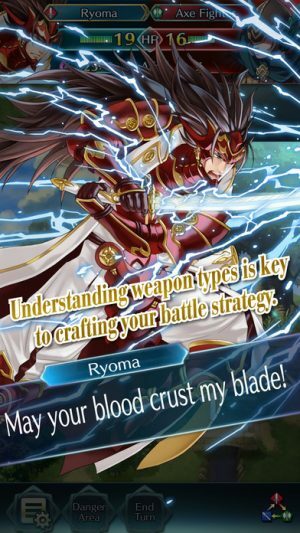 That’s all of the advice I have for Fire Emblem Heroes at the moment. Honestly, it’s not terribly difficult by this genre’s standards. As long as you take your time, pay attention to all of the cues, and don’t have the worst luck in the world on summoning draws, you should at least be able to work your way through the story on normal difficulty. As for Lunatic difficulty, that’s a whole other strategy guide.